Enhance your practice with an interoperable, cloud-based EHR. Accelerate your workflow and protect your records by using a simple-to-use, cloud-based EHR developed specifically to support the LTC workflow. As the first ONC-certified LTC EHR, GEHRIMED was designed by leading LTPAC practitioners who recognize the compliance requirements and efficiency challenges facing today’s practices. Access real-time patient data to support critical clinical decision-making via GEHRIMED’s seamless interoperable partnerships with facility EHRs (PointClickCare, MatrixCare, and American HealthTech). 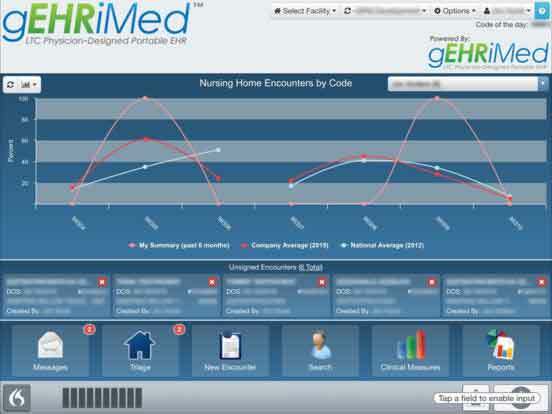 GEHRIMED’s intuitive, easy-to-use software allows your team to spend less time on manual documentation and more time focusing on patients. A seamless transition to electronic record keeping. Reduce charting time and increase efficiency by working with an easy-to-use interface and LTC-specific template designed specifically to match a geriatric clinical workflow, not a general practitioner workflow. Secure access levels prevent unauthorized users from accessing patient records, logging all user activity to ensure that protected health information (PHI) is never exposed. Reduce the need for phone calls, faxes and text messages that can result in insufficient or inaccurate data. Eliminate lost or misplaced notes that delay the billing process. Encrypted note delivery enables you to securely deliver notes electronically to the facility once the note has been signed. All of your patient notes and data are safely stored on the cloud. If ever faced with an audit, retrieving all necessary documentation is quick and easy. Your dedicated account manager will assist your practice with set-up and training so you can begin using GEHRIMED right away. New CMS regulations stipulate that you cannot successfully pass MIPS in future years without a certified EHR. Paper recordkeeping not only eats up a lot of time, it can can put your practice at risk for compliance violations, penalties and lost billing opportunities. Discover how switching to GEHRIMED’s interoperable LTPAC EHR can make your practice more efficient, more effective and more profitable. Your patient records are 100% secure and available at any time. 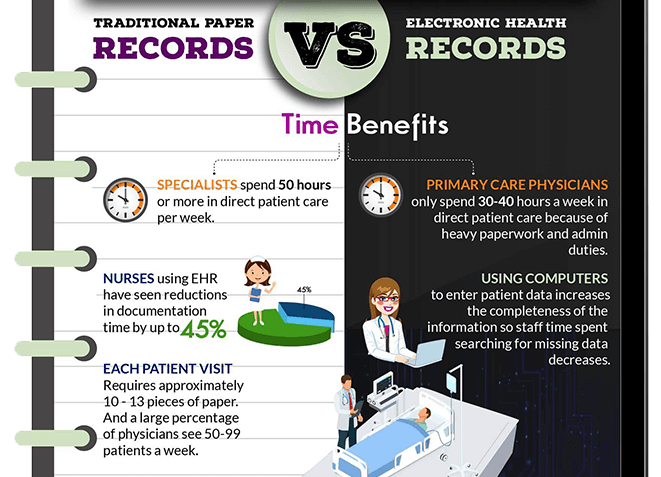 Storing your records in a HIPAA-compliant, cloud-based EHR protects sensitive patient health information and ensures that your record-keeping complies with CMS requirements at every stage. Tiered access control permissions, user activity logs, and dual authentication and encryption features ensure that the right staff have access to information without concern about sensitive data exposure. GEHRIMED features connection extension functionality, allowing encounters to remain active for up to 10 minutes, in the case of weak or intermittent internet connection. Cloud-based storage results in a drastic reduction of the time it takes to access complete record sets. If your practice is ever faced with an audit, your team can quickly and easily to retrieve all necessary documentation.